With a lot of lackluster, modern horror films produced lately Lionsgate had a great idea trying to bring back an iconic horror series of the past, unfortunately the film just didn’t succeed on the same level the series did in the past. In October of 2004, a little unknown film entitled Saw, by then unknown writer/director James Wan (Furious 7) and writer Leigh Whannell, rewrote the modern slasher horror film and created a new modern horror killer, Jigsaw (Tobin Bell; The Flash). It went on to spawn many sequels before it's "finale" in 2010 with the death of Jigsaw in Saw 3D: The Final Chapter. However, his death, as with most horror icons, was premature, and in 2017 Jigsaw returned from the dead in a film entitled simply Jigsaw. This week, Jigsaw comes home for your viewing pleasure. It's been over a decade since John Kramer aka Jigsaw has passed away from this earth; however, dead bodies are continuing to pile up in the city with the same signature that Jigsaw had been known for. How could this be? Had John Kramer come back from the dead to continue his killings? Or is the work of a copycat killer? These are the questions that directors Michael and Peter Spierig (Daybreakers) try to answer from a screenplay by Josh Stolberg (Sorority Row) and Pete Goldfinger (Piranha 3D) which stars Matt Passmore (Lethal Weapon), Callum Keith Rennie (Fifty Shades Freed), Clé Bennett (Private Eyes), Hannah Emily Anderson (Lost Girl), Laura Vandervoort (Smallville), Mandela Van Peebles (Roots), Paul Braunstein (The Thing), Brittany Allen (Falling Water), and Josiah Black (Kindergarten Cop 2). With Jigsaw, producers of the Lionsgate series wanted to go back to the roots of the series as well as also try to bring in new audiences who might have been turned off by the "torture" stigmatism associated with the later entries in series. Unfortunately, they missed the mark on both accounts. When the original Saw film was introduced to audiences in 2004, it succeeded as being a smart low budget thriller, containing A-List stars, and introducing a new style of hyper-realized filmmaking that increased the tension felt by audiences. With all of these elements combined, a new breed of horror film was born. While the later entries in the series did get bloodier and bloodier they still were faithful to the tone of the original film. However, with Jigsaw, the film tried too hard to become a "Non-Saw" entry in the franchise. Gone are the A-list actors (Bell and Rennie are unfortunately the only real stars here), the hyper-realized filming is non-existent, and the story is a run of the mill horror film with the now expected "twist" at the end. While the signature style of the Saw series was abandoned for this film, Jigsaw on 4K UHD looks simply amazing. Presented in 2160p with a 2.39 aspect ratio, Jigsaw's traps seem to almost jump off the screen and be in the room with you. The picture details are sharp. Blacks are deep and spot on, and color depth is extremely deep. 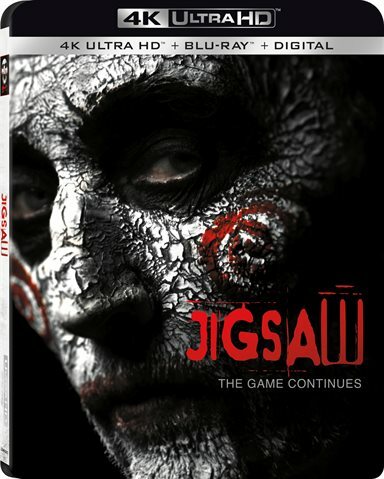 The Dolby Atmos soundtrack featured on the 4K disc makes great use of the height element having the sounds of Jigsaw's traps truly envelope the entire room. With a lot of lackluster, modern horror films produced lately, Lionsgate had a great idea trying to bring back an iconic horror series of the past. Unfortunately, whether it was a lack of interest from the original creators or lack of funding, the film just didn't succeed on the same level the series did in the past. One can only hope they will try one more time and Jigsaw's games can continue in the future with a solid entry reinvigorating the series. Download Jigsaw from the iTunes Store in Digial HD. For more information about Jigsaw visit the FlickDirect Movie Database.